- Display 3-digit bright red seven segments LED display. Digital Fluorometer measures fluorophors like vitamins, quinine, steroids and metal. Supplied with 2 primary and 3 secondary filters mounted on holders. Results are displayed on 3 digit 7 segment LED. Sensitivity in 4 ranges. Fluoro Sensitivity: Full scale deflection obtained with 1 ppm quinine sulphate in 0.1 N sulphuric acid (primary Wavelength 360 nm). We are offering a quality tested array of Digital Fluorometers. The Digital Fluorometers we offer is suitable to meet the applications of various industries. Besides, we assure our clients that a quality tested array is offered from our end. Moreover, our products are available in the market at industry leading prices. We are into offering best quality Digital Photo Fluorometer that is used for analysis of fluorophors such as vitamins, quinine, steroids, fluorescein, metal complexes etc. 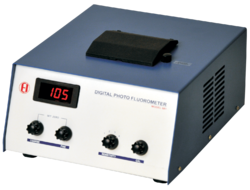 Our Digital Photo Fluorometer is highly in demand for the best design and effectual operation. 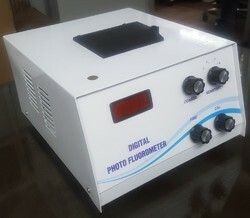 We offer our Digital Photo Fluorometer as per the client’s requirement. Photo-Fluorometer is designed for fluorescence studies in routine or research work in Pharmaceutical, Medical. Agricultural and other applications. The instruments are accurate, sensitive and can be operated without any special skill or training. Test Tube: A set of 5. Warm Up Time: Less Than 35 sec.